A L U M N I M A G A Z I N E issue Winter 2016 marriottschool.byu.edu publisher Lee T. Perry Managing editor Robert G. Gardner editor Megan Hendrickson art director Jon G. Woidka copy editors Amanda Kae Fronk Lena Harper Holly Munson contributing editor Nina Whitehead assistant editor Sara Smith Atwood contributing writers, editors, Erica Allen designers & photographers Alex Burch Kasee Baldwin Bailey Jordan Christiansen Ben Hansen Todd Hollingshead Chadwick Little Collin Pace Brooke Porter Jenn Wilks Magazine design BYU Publications & Graphics all coMMunication should be sent to Marriott Alumni Magazine 490 Tanner Building Brigham Young University Provo, UT 84602 phone: 801-422-7696 Fax: 801-422-0501 eMail: marriottmag@byu.edu Marriott aluMni Magazine is published by the Marriott school oF ManageMent at brighaM young university, provo, utah. the views expressed in Marriott aluMni Magazine are not necessarily endorsed by byu or the church oF Jesus christ oF latter-day saints. copyright 2016 by brighaM young university. all rights reserved. 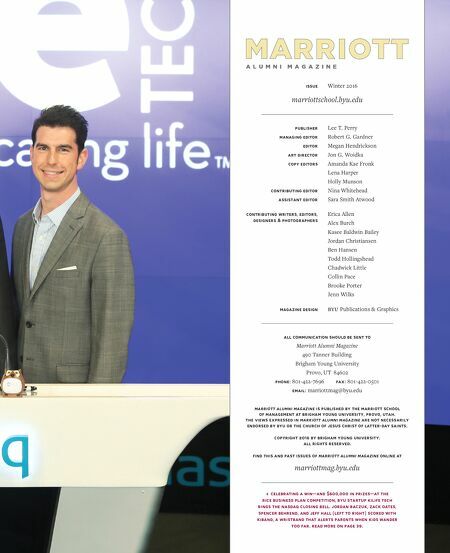 Find this and past issues oF Marriott aluMni Magazine online at marriottmag.byu.edu celebrating a win—and $600,000 in prizes—at the rice business plan coMpetition, byu startup KiliFe tech rings the nasdaQ closing bell. 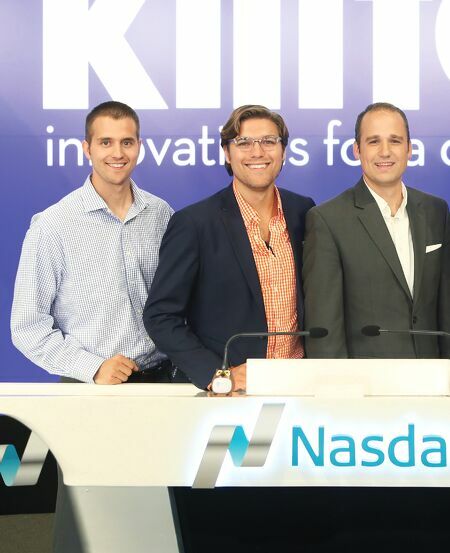 Jordan baczuK, zacK oates, spencer behrend, and JeFF hall (leFt to right) scored with Kiband, a wristband that alerts parents when Kids wander too Far. read More on page 39.